The pharmacy is 44km southeast of Melbourne’s central business district and just inside the urban area. According to owner and pharmacist Louisa Lammers, because the town is a relatively small one, everyone seems to know everyone else. Joining Ms Lammers is a knowledgeable and caring team with a combined experience of more than 150 years in pharmacy. Staff are trained to cater to customers from all walks of life and also qualified to sign statutory declarations. “Our staff are really enthusiastic and pretty much know the names of everyone who comes into the pharmacy,” Ms Lammers said. 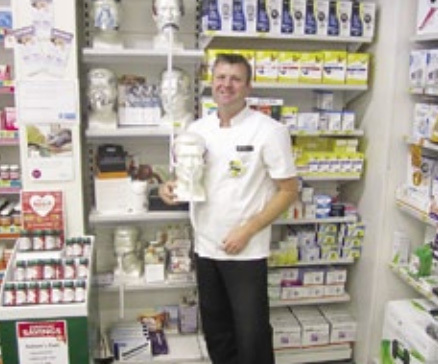 “We are a fiercely independent pharmacy and like to treat our customers in a holistic way. We also aim to source from local suppliers and Australian owned companies. As testament to its convivial environment, the pharmacy boasts a high retention rate for its staff, most of whom have been with the pharmacy for many years. “One of our longest-serving staff members is Gabby D’Arcy, who was recently nominated as a state finalist for the 2015 Pharmacy Assistant of the Year [PATY] Award,” Ms Lammers said. This prestigious award recognises the important contribution pharmacy assistants make to the pharmacy industry. More than 450 pharmacy assistants were nominated in the 2015 PATY Award, breaking all previous records for the event. MemoCare is available through an additional tab within GuildCare software, enabling communication with a patient, even when they leave the pharmacy. MemoCare Support provides pharmacies with training and technical support. The software integrates with all existing dispensing software, while integration with dispensing eliminates typing or manual entering of patients’ details. All relevant details are automatically transferred into MemoCare. “We only started the MemoCare service in March and so far we have around 940 patients using the system,” Ms Lammers said. A new packing service also makes taking medication easier, more convenient and user friendly. These add to the already extensive range of professional and health and wellbeing services provided at the pharmacy. A ‘medication review’ involves a one-on-one consultation with a pharmacist, and can be provided in the store or from home. Priding itself on personal service and helpful staff, the pharmacy is also a registered National Diabetes Supply Scheme subagent and offers customers blood pressure monitoring. Running promotions is another way to attract a regular, returning customer base. “This year already we have run a number of promotions,” Ms Lammers said. “Recently, we ran a Diabetes Day promotion, ‘Know your Numbers’, where customers suffering with diabetes could speak directly to one of our pharmacists in a one-to-one environment.” ‘Know your Numbers’ is an initiative of the National Stroke Foundation, which aims to improve public awareness and early detection of individuals at risk of stroke, type 2 diabetes and other cardiovascular disease. The ‘Know your Numbers’ program facilitates opportunistic screening assessments in pharmacy and community settings. “Customers could also trial a circulation booster and we also had a podiatrist on hand to check the feet of diabetes suffers,” Ms Lammers said. Diabetes can affect feet by reducing blood circulation, and by damaging nerves in the feet. “It is important for diabetes sufferers to take good care of their feet and get regular check-ups either from their podiatrist or their doctor,” Ms Lammers said. Another promotion the pharmacy ran involved asthma management. “Here, we targeted asthma medications and tested an asthma sufferer’s inhalation technique with Ventolin through an over the-counter puffer,” Ms Lammers said. “Fortunately, we were able to correct quite a few customers’ techniques to enable them to better manage their medication.” She says that she and her other pharmacists enjoy good relationships with local doctors. As a small rural pharmacy (single pharmacy town) we are called upon for many and varied services. Times have changed & pharmacy needs to assert its importance as a health care destination, not simply a retailer. To address this, GuildCare has provided great guidance and is a wonderful platform. We have just added MemoCare to our list of services & look forward to providing this service to customers. We have a consultation room to provide a private and comfortable space for services as required, e.g. Blood Pressure, Diabetic Services, Clinical Interventions, Inhaler Techniques, & Weight Loss Programs. Our team, being small, needs to multitask and have been trained accordingly. I feel it is important rural pharmacies are able to provide full care with MedsCheck & HMRs as part of personal care. Recording & documenting what we are doing through GuildCare has increased our knowledge & interest. It is exciting to realise just how much we can achieve & contribute as an on-going process. The ability to provide health services for your community is special & satisfying. Fast Facts with Pease Street Managing Pharmacist Aylin Ektem. Please give some background details about your pharmacy. The pharmacy was initially purchased by Cairns-born and bred brothers Frank and Vince Pappalardo in 2004 as an independently owned pharmacy. There were five staff then. The pharmacy made the decision to join the Discount Drug Store franchise in 2007, and that same year we moved the store and shop-fitted. After four years we had outgrown the store and moved to a larger place in the same shopping centre. Now, we have just completed an extension, adding clinic rooms, a compounding room, Webster packing area, dispensing robot, naturopath wet area, health food store, including fridges and freezers for organic food products and wholefoods, and a café. We now have about 40 employees. What services do you provide at the pharmacy? We offer compounding/extemporaneous pharmaceuticals, naturopath/ practitioner consults, celiac, candida and zinc testing and much, much more: from body composition machine testing to sleep health and sunawareness clinics. How has winning the Pharmacy of the Year Award 2015 affected your pharmacy and its operations? It has affected our business very positively. There has been advertising in the local newspaper and pharmacy publications and on social media as a result. We have taken that opportunity to detail and thank all of our customers, supporters and staff members. Aylin Ektem, Pharmacist in Charge, (seated right) with her team at Pease Street Discount Drug Store. 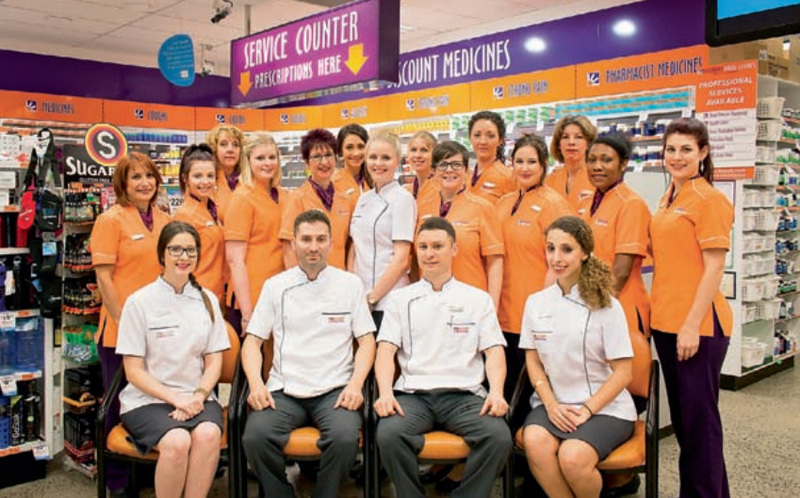 Recently announced at the Australian Pharmacy Professional 2015 Conference, Cairns pharmacy Pease Street Discount Drug Store is the winner of GuildCare’s third annual Pharmacy of the Year Award. Judged by how pharmacies deliver GuildCare’s five professional service programs to its customers, the award saw Pease Street DDS beating more than 4,000 pharmacies currently utilising the GuildCare programs, and taking home a prize of $5,000. The award marks the second year in a row that a DDS has won, after its Eight Mile Plains store in Brisbane took out the award last year. So, what is the secret to the pharmacy’s success? According to Pease Street Managing Pharmacist Aylin Ektem, there are a number of contributing factors, chief of which are innovation and the delivery of excellence in customer service. “Our pharmacy is a one-stop shop: we have a holistic approach to people’s health,” she said. “We are always looking for new ideas and offers to implement to improve our services. We make it our goal to offer the widest possible variety of products and services at the best price. “Our extensive health food range complements the pharmaceuticals. Our new café will offer juices and smoothies using fresh ingredients and also ingredients we have for sale in our extensive health food section. “We don’t back down from a challenge and are always looking for new ways to further enhance our customers’ experience. We are really innovative in our thinking, whether it comes to new ranging within our health food section, the café and juice bar, compounding pharmaceuticals or installing the dispensing robot. Customer service and satisfaction are of the utmost importance to us and we try to ensure a positive experience within the store for everyone. “Professional services are going to be one of the most important things for the sustainability of community pharmacy, but our core focus is on improving health and wellbeing in our region and GuildCare’s programs play a fundamental role in ensuring that we achieve this. Our role within the community is ensuring quality use of medicines, as well as complementing medical practitioners and other healthcare professionals around us. “Services within community pharmacy have been growing and evolving rapidly in the last 10 years and will continue to do so. We implement several professional services at Pease Street DDS where these services offered become unique to our pharmacy. GuildCare’s programs aim to improve customer compliance and adherence to medication and to provide more free in-store health checks and intervention services. GuildCare offers 6CPA Pharmacy Practice Incentives, 6CPA Medication Management, Private Service and Patient Adherence programs and the New Admin module. GuildCare program streams are designed to enable Australian pharmacies to deliver professional services to their patients. As GuildCare programs integrate with dispensing software, pharmacists spend less time searching and retyping patient information, and can focus on delivering services. GuildCare is the only professional programs and services software package that is available to pharmacies nationwide. The software has been designed to integrate with pharmacy dispensing software with the pharmacist’s workflow in mind. “Our pharmacy recently underwent a large expansion to provide a diverse range of healthcare services in line with the GuildCare programs, including New to therapy and compliance programs. To help customers understand their medications better,” Ms Ektem said. “Pease Street DDS made it a priority to implement MedsChecks, New to Therapy and Compliance programs, and Clinical Interventions, into the routine of dispensing and counselling.” Ms Ektem says she is particularly pleased with MedsChecks and Diabetes MedsChecks, the first professional services the pharmacy implemented. “This professional service was the one that I had the most information and training on,” she said. “It was also an easy professional service to get all pharmacists registered for, which could further help us implement it across the entire store and within our group. “Pease Street DDS made it a priority to implement MedsChecks into the routine of dispensing and counselling. GuildCare has helped streamline processes that would have otherwise taken longer to complete and log,” she said. Despite remarkable successes, the pharmacy has not been without its challenges. “When new things are developing, it takes a lot of time and energy to keep it improving and growing,” Ms Ektem said. 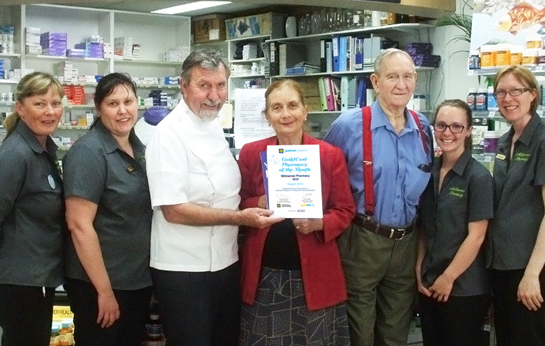 Servicing the health of the community since 1896, Moodie's Pharmacy is the NSW Central Tablelands city of Bathurst's oldest pharmacy - and winner of the 2015 Pharmacy of the Year (POTY) Award in the Innovation in Professional Services category. Fast Facts with Pharmacist Paul Jones. Moodie's Pharmacy was previously Moodie & Bloomfield Pharmacy and there has been a pharmacy in the current location since 1896. It is Bathurst's oldest continually running pharmacy. The two previous owners, Warren Bloomfield and Peter Moodie, were both third-generation pharmacists and both families had owned pharmacies in Bathurst for more than 100 years. I purchased the pharmacy in January 2003, and it was a Soul Pattinson Chemist until 2007, when we went independent. Moodie's Pharmacy is open seven days a week and has 25 staff, with four pharmacists and a mix of full-time and part-time staff. What types of services do you offer at the pharmacy? Today, we offer a full range of services, including sleep apnoea assessments and equipment, diabetes and blood glucose monitoring, cholesterol testing, drug and alcohol services, quit-smoking programs, sick/leave certificates, EasyDose medication packs to better manage your medications and home medication reviews for advice on patients' medicines We are aiming to add more services once we can work out a business case/model that allows us to get paid for each of them. We look at how a service can generate additional revenue, or break even. Has winning the Pharmacy of the Year Award 2015 affected your pharmacy and its operations? Winning the award has been recognition for all the team that their hard work has paid off. We have made a lot of small changes over time to achieve the results. It also shows that patients want services delivered through pharmacy, as it is convenient and accessible. We are continually trying to improve our services. It's very exciting. It's recognition of doing something a little differently, taking what you've got and having a go at it. "With Paul Jones and Moodie's Pharmacy in Bathurst, the exciting thing about it was the enormous effort that Paul and his team has made to make sure the delivery of professional services were integrated into his pharmacy and they were done in the most user-friendly way possible. "He gives great thought to it, not only the set-up of the rooms, but also the fact that they are just adjacent to the pharmacy and they have wide open doors and it is very easy to transition from collecting your medicines to sitting down and having a consultation. "Everywhere he has just made an effort to make sure it is nonthreatening and friendly for the patient." According to pharmacist Paul Jones, it's that extra effort that has proved a winning formula for Moodie's. "I believe what sets us apart is that we're not just talking about services, we're on the ground delivering them to outpatients and customers," he said. "The three key things that enable us to deliver services, and set us apart from other pharmacies, are our ‘easyclinic' consultation rooms, well trained pharmacists and GuildCare software, which enables us to record what we're doing. "The investment in our ‘easyclinic' consultation rooms has allowed us to expand the professional services from what we've traditionally done. "Initially, we were providing blood pressure monitoring, Diabetes Australia-approved blood glucose testing, weight loss, height and weight and methadone services, but since the shop-fit we've added sleep apnoea along with a further 10 or so more services. "We have two easyclinic rooms that are fitted out with everything we need, and are designed to accommodate patients with limited mobility access. Each easyclinic room has easyclinic boxes, which have everything in them to deliver a particular service. For example, the ‘easyclinic cholesterol' box has an instruction sheet, cholesterol-testing machine, disposable gloves, sharps container, and single-use lancet, etc, for providing cholesterol testing. "The easyclinic boxes [as pictured above] include [those for] diabetes, cholesterol, blood pressure, weight loss, asthma, and sleep apnoea, while the rooms each have a table, three chairs, a computer and all the necessary equipment to deliver services. "Training each of our pharmacists to deliver the services in a structured and systematic manner is key, as this creates value to the patient, and they are more willing to pay for this. "Also, using the GuildCare software, and printing a report, and being able to hand the patient something tangible are important as part of the value proposition. "GuildCare software allows us to record and document what we have and are doing. This is crucial, as the pharmacy is open 70 hours per week and none of the pharmacists wants to work all the time, so it allows us to deliver continuity of care. "The software also underpins the mantra of ‘if you didn't record it, it never happened', which is essential for QCPP and will be essential for PCeHR (patient controlled electronic health records). "By recording what we've done in GuildCare, we're able to demonstrate over time, by measuring what we're doing, that we're making a difference to patients' health. So have there been any challenges? "There have been a couple of key challenges in delivering services in the running of the pharmacy. These can be divided into two broad groups, the first being the people [staff of the pharmacy], and secondly, the customers. This is in addition to all the normal day-to-day challenges of running a pharmacy," Mr Jones said. "When we first built the two easyclinic rooms in September 2012, we previously had one consultation room and a weight-loss booth in the pharmacy. “The challenge was to redefine how we used the two easyclinic rooms, and who would deliver the services. According to Mr Jones, another challenge was to educate existing, and new, customers that the pharmacy did more than dispense prescriptions: it also provided services based around their health needs. “We marketed these services under the easyclinic banner, which is provided by Pharmacy Catalyst. Having a consistent message with marketing that allows us to deliver a whole range of different services is really important,” he said. Looking ahead, Mr Jones says pharmacies will face a sizeable challenge in stepping up their services capacity post-6CPA. “I believe that pharmacies and pharmacists know they need to change, but what do they need to change to? For many, it is a great unknown,” he said. “In some respects, pharmacies will need to get bigger to allow them to have two pharmacists at once, as it is nearly impossible to deliver any meaningful service uninterrupted while the pharmacy still processes and dispenses prescriptions. “Ultimately, this may mean a rationalisation in pharmacy numbers where there are too many. “I also think that for a pharmacy to deliver a service, it needs to have some form of a consultation room. I believe that in the UK, when they introduced the minor ailment scheme (PMAS) in 2008 that a pharmacy needed to have a consultation room – overnight, pharmacies in the UK started to put in consultation rooms. “I don’t think the 6CPA provides all the answers for pharmacy, which needs to look outside of government to pay for services. First and foremost, pharmacy needs to decide if it is a healthcare provider or a retailer. I say this because I think consumers see pharmacy as a retailer and, potentially, so do parts of the health system. As a result, we’re not seen as being able to deliver health services. “Over time, pharmacy has become reliant on the PBS, and this has not encouraged innovation, but rather complacency. I think the 6CPA has provided a framework to allow pharmacy to transition to a different business model, not just supply and retail, but also to an evidence-based supply and service model. This will involve a lot of change and evolution, and if pharmacy leaves this too late, then pharmacy will have a revolution. “Pharmacy owners need to invest in the future, that is, the medium to long term, and not just the short term.